1. Family Practice that can accommodate the entire family at one time under one roof. 2. No need to get a sitter to get your dental work completed – we have complementary childcare waiting for you in a child-friendly space built just for kids! 3. We are ready to serve Evenings, Fridays, and Saturdays. 4. Almost all dental procedures under one roof including having dental implants placed, not just restored, sedation and same-day crowns. 5. Only practice in Raleigh and one of 6 in the State with Identafi Oral Cancer Screening technology. 6. 5 star reviews and ratings as a testimony to our adherence to our core values. 7. We made certain that our pricing was more than competitive and have many options to meet your financial needs. 8. We do complimentary benefit checks and are in network with most dental insurance companies. Let us know what insurance you have and we will do our best to become in network with them if we are not already. 9. No previous X-rays or records from your previous dentist needed initially. We want to make finding the right Dentist for you as easy as possible. 10. Emergencies: Call us before 10:00 AM we will see you the same day -guaranteed! How We Train Our Staff…Every Smile Has a Story. 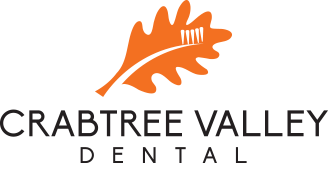 Crabtree Valley Dental Training Video. We will assure our patients that their well-being and interests are our number one priority. In doing, so we will carefully review their treatment plan, as well as our policies, procedures and pricing. We want to “walk a mile in your shoes” and deliver custom-tailored service that exceeds your expectations. You deserve the best treatment possible for choosing us. You have a story that is unique and special. We honor you as an individual . All our treatment revolves around love and compassion as we build our trusting relationship. We will value our patients time by doing everything possible to provide the highest quality dental care, in an efficient and effective manner.